Mountain Valley Horse Rescue operates out of our recently purchased 114-acre ranch, located between Vail and Steamboat Springs. 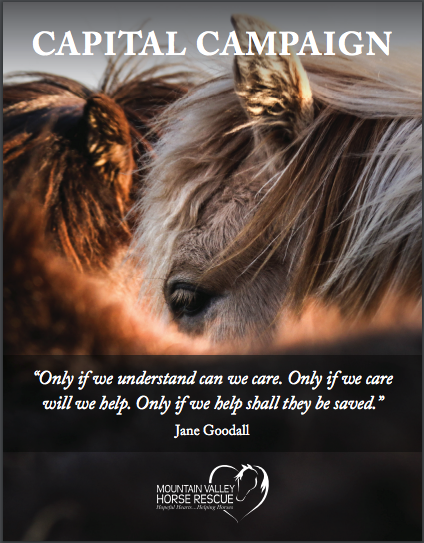 We are one of the only horse rescues on the western slope and our services are provided wherever a horse is in need. We rely on volunteers, foster homes, donations, and sponsorships to provide for these horses. Horse rescues do not receive any federal funding, and it costs approximately $5,000 per year for the basic care of one horse (not including luxuries like winter blankets or training). With every dollar we raise, the lives of horses are saved and their futures, secured, because of caring people like you. Our Rescue Heroes provide broad-reaching support for the day-to-day needs and activities of the ranch. Rescue Heroes are our largest supporters and ensure that MVHR is always moving forward with its mission to rescue, rehabilitate and re-home every horse in need. Equine Advocates assume the cost of care for one horse on property. Each underwriter is matched with a horse, and his or her name is listed on a plaque of the stall for that horse. We provide updates on the care and status of your horse and encourage you to come out to the ranch to meet the beneficiary of your support. Wranglers provide the support for our team to be engaged in the community, providing for MVHR’s outreach and education programs. The education programs allow hundreds of local community members to learn about the care of the horses, and how to intervene, when needed. Ranch hands provide the basics of care for our horses: hay, feed, halters and other essentials that all horses need to thrive. Stable Mates support our volunteers, which are the lifeblood of MVHR. We depend on the kindness of our volunteers to muck out stalls, water and walk the horses and provide plenty of love to them. We have more than 100 active volunteers today but are in need of constant outreach and training to expand our reach. Every dollar given to MVHR is needed, and used to provide care to our horses in residence. We thank you for your kindness! We were blessed in 2015 to receive a gift of $1 million from the Shaw Family Foundation to purchase the ranch our horses now call home. However, the ranch will need another $1 million in improvements to provide for the horses into the future, including building of a barn, caretaker residence, indoor and outdoor arenas and hay storage. Please click here to learn about our campaign and giving opportunities, or contact us.